Open daily, 11:00 AM to 9:00 PM. For over 25 years, Austin’s in Incline Village’s Country Club Center has been a tried and true favorite for locals and long-time visitors alike. From the Chicken Fried Steak to the famous Doug’s Salad, the menu keeps many of its signature items while bringing in something fresh and new to take advantage of the freshest seasonal ingredients. Our dining room is cozy yet spacious, and on Memorial Day, we open the patio allowing guest to enjoy the fresh air and amazing Tahoe weather. It is also a great dog-friendly spot for friendly dogs. Austin’s features a full bar with a wide selection of wines, drafts, and the ability to make any cocktail you desire. You won’t find any mixes here! We take the extra effort to freshly squeeze and prepare our ingredients which we believe makes all the difference. Be sure to try our Chicken Fried Spicy Bloody Mary or something from our many choices or Bourbon. 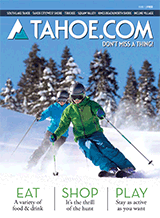 Of course, we love Tahoe, and are committed to the health of our community and environment. We proudly feature seasonal, local and organic ingredients and produce from various sustainable farms. We support abundant oceans and serve only sustainable seafood. Our disposable service ware, from straws to takeout bags, is biodegradable and compostable. Our trans-fat free oil is used to make biofuel and all of our cardboard, paper, glass, plastic and tin is recycled.